What is an international exam? An international exam can be compared to a measuring instrument, which helps to assess your foreign language skills. On passing an exam, you get a certificate confirming your language proficiency level. Why do I need an international certificate? International examinations in English are to be taken by non-native speakers. Candidates are assessed by independent examiners - qualified, experienced English language specialists. Taking an international exam is a serious step in the life of every determined language learner, because it offers a whole range of new opportunities. Evaluate your knowledge and plan your future. Nowadays, there are a number of exams known internationally and different both in their structure and purposes. The most popular ones are Cambridge Examinations, IELTS, TOEFL and City&Guilds. The choice of an exam should be determined by your individual goals. Moreover, some international certificates are valid for a limited period of time (for instance, IELTS and TOEFL certificates are accepted during a two-year period only, after which you need to sit an exam again if you need to). 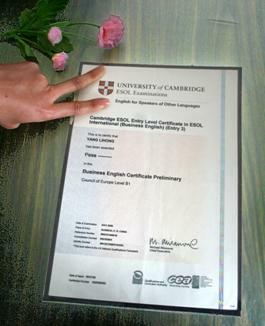 Once awarded Cambridge ESOL and City&Guilds certificates are valid for life. However, it is obvious that any employer or educational institution would prefer to see a recent document. IELTS test is necessary for those who plan to immigrate to such countries as Canada, Australia or New Zealand. It can also help entering a university in one of these countries, as well as in the America, Great Britain or in the Ireland. Considering the opportunity of taking an international examination, it is important to remember that only a certificate with a high band/proficiency level is valuable. For example, an average IELTS score needed to enter a university is 6.0. Therefore, while planning to take any international exam, it is crucial to define your aims clearly and assess your language skills in a right way (O’key School specialists are always ready to help you with it). It is strongly recommended for all candidates to spend enough time on their preparation for an exam and its specific format. Qualified O’key School teachers, who have one or more international certificates, can provide you with their professional help in international examinations preparation. Perhaps, it is high time you started to get ready for an examination that can give you a chance to assess your language skills, and maybe even change your life miraculously. Probably, you have children who study at school, but there is plenty of time before they leave it. For sure, they learn English. So why do they need an international certificate? Sometimes they have hardly enough time to do their homework! However, it is important to remember: better early than late. So, the earlier your child gets acquainted with the exam format, the less stressed they will be taking it the next time. Besides, children will grow more responsible for what they do: if they take a serious exam at this age, in future they will be confident and capable of achieving their aims (and acquiring necessary qualification they are dreaming about as well). How to choose the most suitable exam? Our site provides brief information about the most popular international English language exams: Cambridge Examinations, IELTS and TOEFL. It will give you a general idea of different examination systems. We would also recommend you to contact O’key Language School. Our specialists will give you more detailed information regarding international certificates and their advantages, and will help you to choose the one that suits your aims best. Where can I get prepared for an exam? Any serious examination requires a thorough preparation that includes not only mastering your language knowledge, bur also training in every specific aspect of the exam you have chosen. In other words, you need to practice in doing sample examination tasks to do well at the real exam. It is necessary to manage your time and cope with stress – it means that you should get to know some strategies that can guarantee at least a half of your success. Besides, all the international examinations test several language skills: reading, listening, writing, and speaking. So, even if you have no problems with speaking English, probably you need to lay emphasis on practicing other aspects. Our school offers an opportunity to prepare for the majority of globally recognized international examinations. You can join the existing group if it suits your language level, wait until a new one is formed, or take individual lessons. For further information contact our administrators. Where and when to take an international exam? You can take an examination in authorised exam centres all over the world and in as well. An exam centre can also conduct an off-site session, if some other educational institution, which is not an authorized centre, has a group of candidates and can arrange the examination at their location. Each international exam has its own timetable for the year. Examination sessions are carried out simultaneously according to the timetable in the centres all over the world. Timetables and addresses of authorized exam centres are available on official sites and in any local exam centre.